Joseph Hayton’s desire for creation and flare for carving led him to establish his own business and become a sculptor full time. Opening his own workshop and gallery in early 2012 his work is already in private collections spanning from Glasgow to London. Recently Joe’s work has been recognised when he won the opportunity of creating Nidderdale’s newest piece of public art. Joe’s statues will work as part of a series of art projects along the Way of the Roses Cycle route from Morcame Bay to Bridlington. ID Creations has previously worked with Joe on creating his logo and leaflet design. Joe’s next project was to create a website that would showcase his gallery of work. ID Creations created a WordPress website with the main focus on showcasing large images of Joe’s work via a slide show on the main homepage. The site also needed a gallery section for each area, such as Stone, Clay, Bronze etc. 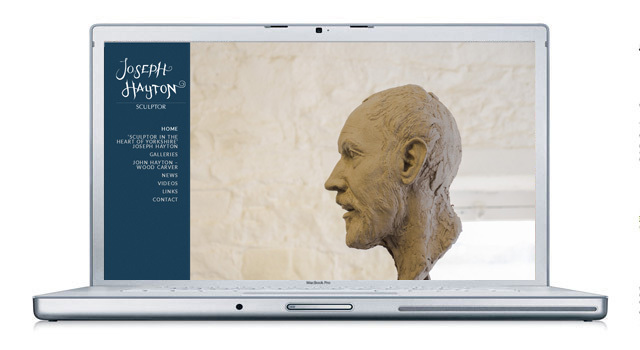 The site features a sub section for Joe’s father, John Hayton – Wood Carver, who works alongside Joe in the workshop in Pateley Bridge. His commissions include hand carved domestic and ecclesiastical pieces as well as rocking horses in American tulip wood. The WordPress website has a built in content management system, allowing the client to regularly update the site. “ID Creations built the website for my company and it suits my needs perfectly. This is the second time I have used them and once again I got a quick and highly professional service. I will definately be using them again in the future”.